Ok, let’s all shout it together now…MURTAGH!!!!!! We felt he might pop back up given the way he and Jamie parted ways last season, but still, this was an amazing surprise! Hello, our new favorite silver fox. Rawr! Book readers may be a little puzzled by his return, but we’re fairly certain he’s replacing Duncan Innes as the man who gathers the settlers for Fraser’s Ridge, then again Fergus is still out there as well so there may be another role Murtagh will play. We really enjoyed the new Murtagh. This is a man who seems to stand a little stronger and prouder than before. This is a man in charge of his own fate. It’ll be interesting to see how this new Murtagh and Jamie get on as time goes by. Whatever the future holds, we all teared up a bit at that reunion right? Admit it. We all know Claire is no shrinking violet, but this episode is a real reminder of how strong she is. Readers will recall that Claire isn’t alone when Herr Mueller shows up, but we appreciate this change in the story because it gives Caitriona Balfe a chance to once again show us that Claire is the lioness we need. While Jamie and Murtagh are reuniting, Claire is up on the mountain just trying to survive! They’re having drinks and attending clandestine meetings, meanwhile, Claire is delivering babies, negotiating peace between trigger-happy settlers and the local Cherokee, keeping home and hearth running, guarding herself and Rollo from all manner of trouble, and trying not to lose her mind when facing down the man her murdered her new friend. There’s a strength and fear in her eyes during this entire episode, you feel all the emotional trauma radiating off of her. Superb acting. As a side note, we’d like to know the kind of soil at Fraser’s Ridge because apparently it’s like mutant mega rich soil for so much lettuce and carrots to be growing so rapidly. We’d like some for our own gardens please and thank you. Also, we cry foul that Claire can suddenly knit and we did not get the scene where Jamie and Ian are trying to show her how to do it. Season 4 DVD extra features, we’re looking at you. Further, may we humbly suggest that Jamie, Claire, and Ian open their own construction company because that log cabin is utter perfection. So symmetrical and sturdy, what did they treat that wood with to keep rot out? How did they hew those planks so perfectly smooth? There’s money here folks, especially if they start having settlers move into the Ridge. So let’s leave the past for bit and head to the present where “The Saga of Bree and Roger” continues. Poor Roger, not only did his lady break his heart but she’s left him for another century altogether, and she completed the gut punch with a “Dear Roger” letter. Ugh! We’re excited to see how Brianna will handle herself in the past and that we may finally get to see her grow as a character, however, how far do we think Bree’s going to make it in those clothes? With all the study of history she’s done and watching her mother make the bat-suit, you’d think she’d make a better attempt at trying to be somewhat accurate to period. Claire didn’t know she’d be going through the stones the first time, so her going in modern clothes was understandable. Bree’s got time to prepare and knows better, and she still goes like that? Geez. Once again, Bree just makes herself a difficult character to like. We’ll wrap this up with these thoughts. This series is not short on examples of humans being brutal toward other humans. It’s also no stranger to that being done based on superstition and revenge. But how heartbreaking is it when innocent people are caught in the crossfire like Mueller’s wife and Adawehi. It’s so easy sitting in our 21st-century living rooms to pass judgment, but we’ve also got the gift of hindsight and the knowledge of modern medicine. Helping the reader really dig into the mindset of these characters who only know the times they are living in is one of the things that the books do so well that sometimes a show just doesn’t have the time to get into. This season is bringing up a lot of uncomfortable questions and this is another episode where we’re left with an ending that has no real justice. Ok…once more…MURTAGH!!!! Sorry, we couldn’t help ourselves. We’re looking forward to next week and the return of LORD JOHN GREY!!! Book readers, are you excited to see this play out? Viewers, how do you think this reunion is going to go, especially since he has William with him? Book Beat! Quick takes on #WeNeedDiverseBooks with The Great American Whatever and All American Boys! NYCC 2016! Iron Fist Cast Autograph Signing! The Netflix Series Takes Over New York! 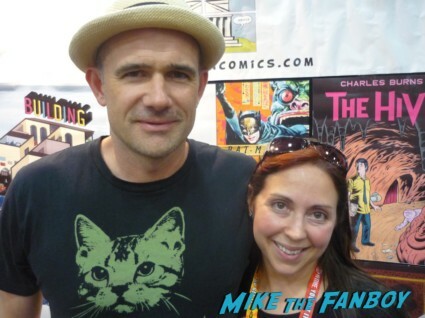 The Novel Strumpet Interviews Mark Z Danielewski About His Awesome Novella The Fifty Year Sword! Outlander Recap and Reflection! Droughtlander ends with The Battle of Culloden!